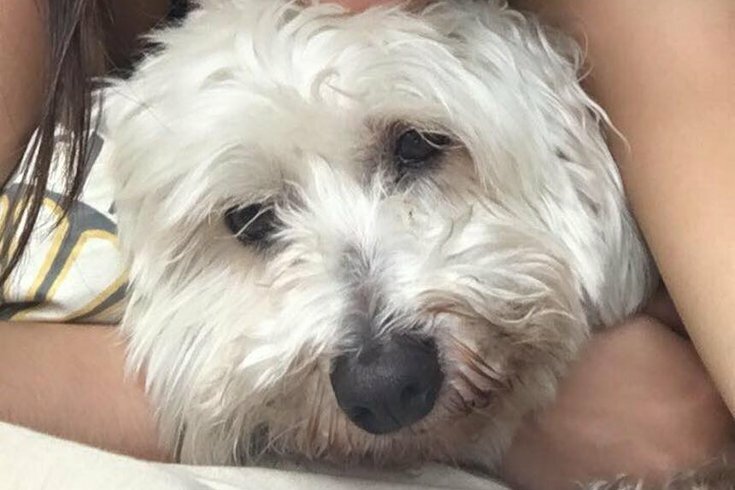 Charlie, a 12-year-old Bijon/Maltese mix, has been missing since Saturday, Sept. 9, 2017 when a thief took the car he was riding in from a Center City Philadelphia garage. The good news? The stolen car has been found. The bad news? Charlie is still missing. When a car thief made off with a 2010 Buick Lacrosse in Center City on September 9, he also stole a beloved family pet. 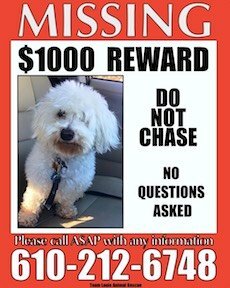 Charlie, a 12-year-old Bichon/Maltese mix, has been sorely missed by Marielle Halper and her family since the incidental dog-napping at 1919 Market St.
With little more to go on than a video and pings from a mobile phone that was left in the stolen car, the past two weeks have seen volunteers with an animal-rescue group working tirelessly to help police locate and, ideally, save the missing dog. On Friday, Missy Morrissey of Team Louie Animal Rescue brought PhillyVoice up to speed on the case. The vehicle itself was recovered last Saturday near Front Street and Allegheny Avenue in the city’s Fairhill section. The driver – a 49-year-old man who lived nearby – did not match the description of the initial thief. “He told the detectives that he didn’t know anything about Charlie,” Morrissey said. He was charged with receiving stolen property and unauthorized use of a motor vehicle before being released on his own recognizance on Tuesday. His preliminary hearing on those charges is scheduled for October 3. While the arrest did not help locate Charlie, it enabled volunteers to regroup and focus their efforts on areas in the city in which he may have been left after the initial theft. A poster offering a reward for information leading to Charlie's safe return. The running theory now is that the car thief looked to unload stolen property – including golf clubs that were no longer in the car – somewhere in Kensington. That would help explain the location of, and delay between, pings from the stolen mobile phone. She's hoping volunteers who want to help find Charlie will meet up at 10 a.m. Saturday at the Rite Aid at 2301 Walnut St.
From there, they will set out to post missing dog flyers along the path from Center City through Kensington, Harrowgate and Fairhill. “He has to be in there somewhere,” Morrissey hoped. Though she and her family are still without their beloved pet, Halper spoke about being buoyed by this week's updates.